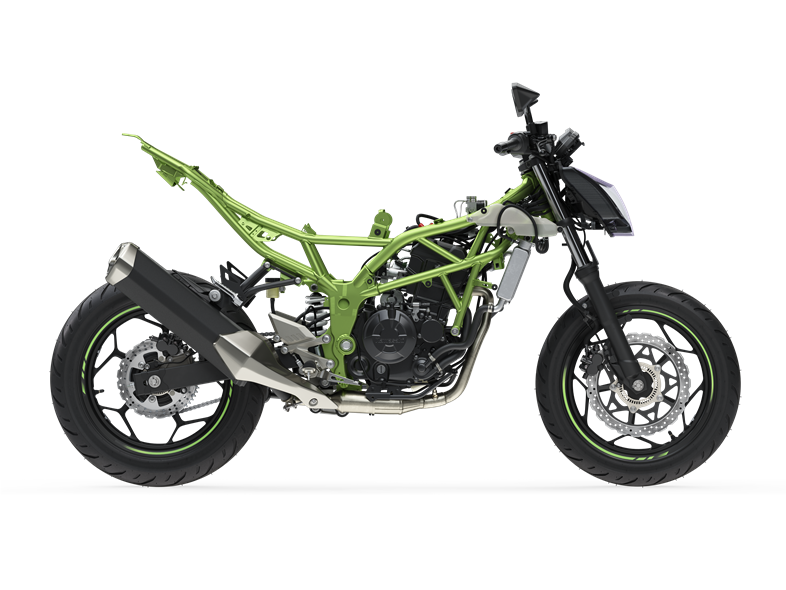 The Z125 features a full-size chassis. With a slim, compact trellis frame, sporty suspension and lightweight 17” wheels, the light, nimble handling they offer is ideal for new riders to become familiar with operating a full-size motorcycle. Like its larger brothers in the Z Series, the Z125’s aggressive styling hints at its sporty potential. A dynamic design created by its slim, hourglass figure is complemented by extremely lightweight looks care of sharp, close-fit bodywork and an original trellis frame. The Z125 light, nimble handling character together with an upright riding position and wide handlebar put the rider in the ideal position for active control, facilitating dynamic, sporty riding that enables the Z125 rider to deftly navigate urban traffic. Smooth-shifting six-speed transmission complements the sporty street performance, offering a gear for every situation. The clutch engages smoothly and disengages cleanly, making it easy to operate for new riders and optimising clutch feel for on-road performance. Uni Trak rear suspension provides great road holding ability and bump absorption, contributing to the bike’s sporty handling. The shock linkage decreases leverage on the shock as the suspension is compressed: small bumps are damped very lightly while big bumps receive lots of damping. The shock has a 5 stroke of 60 mm, helping to ensure the balance of lightweight handling and a composed character. 5-way rear preload adjustability allows riders to adjust the rear ride height, as well as set up the bike to accommodate a passenger or luggage. Smooth power delivery contributes to the Z125’s 125 cm3 engine’s feel-good performance. Like a typical Kawasaki engine, the engine delivers a good “punch” at high rpm, and continues to pull right up to the rev limiter. Reliability inherited from its robust 250cc base engine adds peace of mind. ABS (Anti-lock Brake System, oftewel AntiBlokkeerSysteem) zorgt voor veilig en stabiel remmen door het voorkomen van blokkerende wielen.